We're loving us some SUMMER TIME! headed for Shipshewana and Michigan City! But we'll be back in time for fireworks! Hope you all have a very happy Independence Day! Truth be told, I am not an early riser. My inner clock likes to stay up late and sleep late too. I don't remember alot of times in my life where I've been able to live by that kind of schedule though! First it was being a school age kid. Up, dressed, and ready for breakfast with my siblings at home. Then it was college where "first hour" classes meant skipping breakfast and sometimes a shower just to grab a few more precious minutes of sleep. After that I joined the real world and a full time job had me going to bed by 10pm and rising in time to look adequately chic for the day! It's not been until the last few months that I've settled into a late owl routine. And I have to shamefully admit....I love it. I know there's people out there who totally believe in the early to bed/early to rise philosophy, and I completely respect that. There's others who are saying right now, 'Yeah, just wait til you've got more kids/older kids/early morning kids'. And I guess that's my point....right now it's just me and Blake in the mornings after Josh leaves for work. Blake usually wakes up around 7am and Josh will bring him in to lay down by me in bed and drink his morning bottle of milk. Why? Because now instead of thrashing around and poking my facial features, Blake will snuggle in close to his mama for a good hour and sometimes doze off right by me. We wake up slow. He reaches over to put his little hand on my face and curls up in a ball under the covers. It is sweet and I hate for it to end. Sometimes I just lay quietly by him and talk to God- just to say thank you for these times. The times where I am reminded of the great gifts in my life. The times where I'm not thinking about the goldfish crackers smashed into the carpet or crayon marks down the side of the t.v.! It never lasts much longer than the last drip of milk in his bottle, and we are up for the day. All it takes is that little hand taking out his bink, looking at me with those big brown eyes, and saying 'Mmm nummy yummy'? And I know there's a rumbly in his tummy waiting for breakfast. 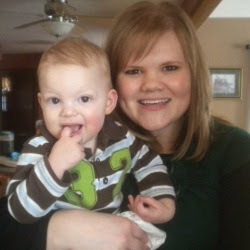 But until that first jabbery sentence of the day, I'm content to snuggle my not-so-baby-anymore boy. No. We have not taught Blake how to flash a peace sign. It's just a funny little post picture taking discovery I made as I was scrolling through my recent photos! As Blake was walking away from his camera fanatic mama, I couldn't help but think how fast he's growing and how much he loves his Daddy. If I said I don't try new recipes because I'm trying to avoid having baked goods in the house, would you believe me? Hmmm.....didn't think so! It just always seems like I don't have the right ingredients in the house when I am flipping through a new magazine, and then it ends up sadly forgotten about. I'm determined to change my ways! And this recipe is my first shot at it. Heat oven to 375 degrees. In a medium-size bowl, whisk together flour, baking soda, and salt. Set aside. In large bowl, beat together butter and peanut-butter with an electric mixer until smooth. Beat in both kinds of sugar until pale-colored. Add eggs and vanilla, beating until smooth. On low speed, beat in flour mixture just until combined, or, alternately, stir in by hand. Add chocolate chunks and stir until evenly distributed. Using a small scoop, form mounds of cookie dough on a large cookie sheet (about 12). Press down with a fork in a crosshatch pattern. Bake at 375 degrees for 15 minutes or until browned. Cool on wire rack; repeat with all dough. End result? A really yummy cookie! My oven is always about 25 degrees hotter than the dial is set at, so I'll admit that a few of these babies got a little scorched on the bottom. But the ones that I pulled out at the right time were super soft, peanut-butter, ooey-gooey chocolate yumminess! 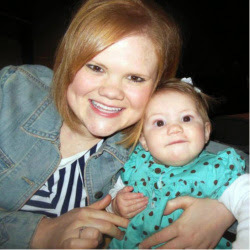 One of my favorite, newly discovered blogs...so impressed and encouraged by this mama's heart! Please Enjoy! 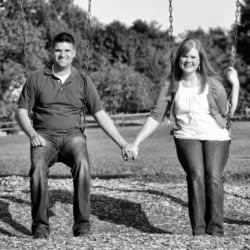 The Wiegand's: giving: "Do you know the story of the widow's mite? I will summarize big time here..... it would be like if you had a million dollars and gave $100...."
I am a klutz. This post will be picture-less for 2 reasons: First, there's nothing to picture. Well unless you invision my complete clumsiness and inability to fix reason for no pictures #2. Second, my camera lens has pathetically crawled back into it's hole after being dropped in the beautiful sandy beach of Lake Michigan. Second confession: I am forgetful. My camera has resided in Ohio since I left it there mid-January after a rousing birthday party for some of my favorite littles- Jack and Addisyn. I've been using Josh's old camera, which is better than having nothing. But I was SO looking forward to taking some nice pictures to post with! Instead, on one of our fist excursions after I got my camera back, I dropped the poor thing right into a sandcastle. There's little hope! At least until I scrounge up enough fix-it money or convince Josh we needed a newer, trendier model anyway!